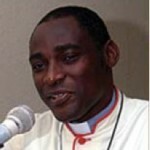 Reverend Canon Gideon B. Byamugisha is an Anglican priest in the Diocese of Kinkiizi, Uganda and a canon of St Paul's Cathedral, Namirembe and Holy Cross Cathedral-Lusaka, as well as the founder of the Africa Network of Religious Leaders Living with or Personally Affected by HIV and AIDS (ANERELA+). In 1992, he became the first religious leader in Africa to declare he was HIV positive. Byamugisha is currently serving as Goodwill Ambassador on HIV and AIDS for Christian AID (UK) for Eastern Africa, Sudan, and the Horn. "Doing More and Better Against HIV & AIDS related Stigma, Shame, Denial, Discrimination, Inaction & Mis-action"